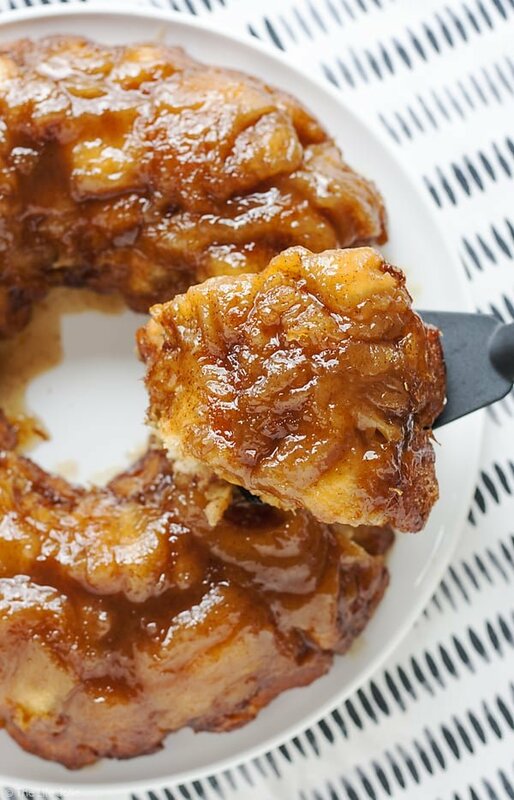 Orange Cinnamon Roll Monkey Bread - an easy twist on a family favorite recipe. 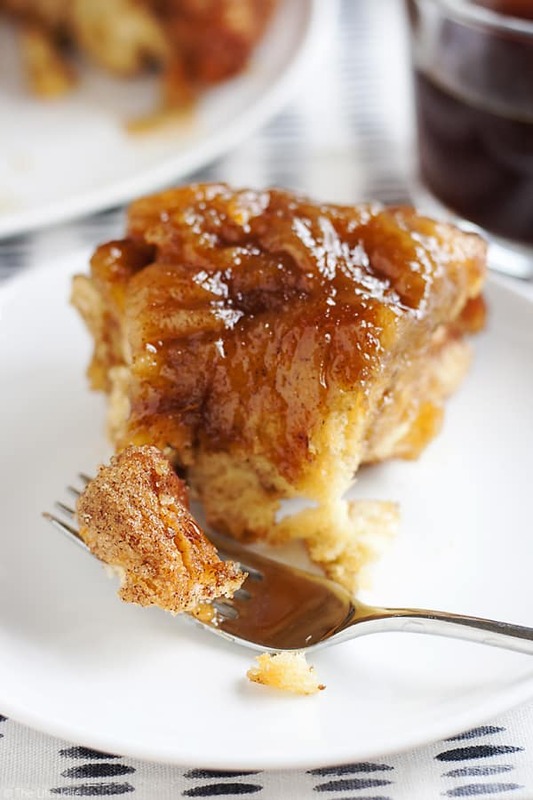 Orange Cinnamon Roll Monkey Bread is an easy and delicious twist on a family favorite recipe. It can totally be made ahead and is perfect to enjoy at brunch or any family gathering! 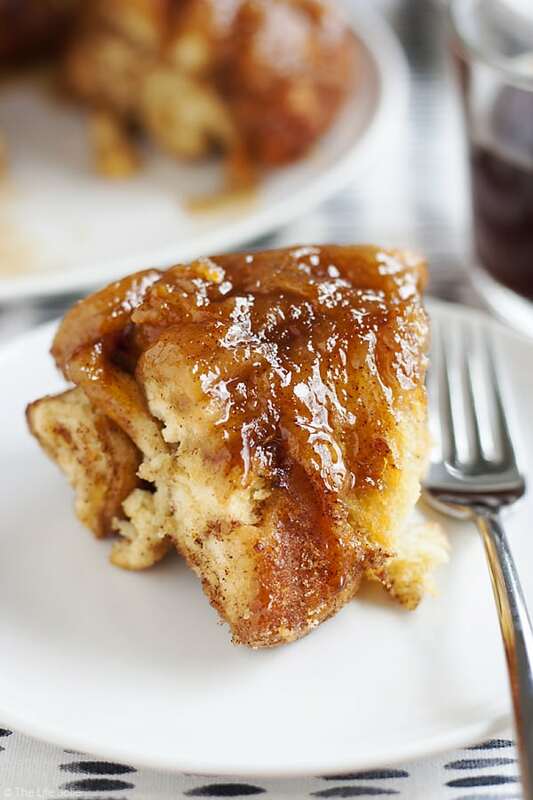 Pillsbury Monkey Bread is a favorite in many American families, both for it’s easy preparation and it’s ooey-gooey cinnamon-sugary goodness! Also known as pull apart bread, it’s made with cut up refrigerated biscuits and once it’s ready you can reach in and pull each sticky delicious piece apart which makes it fun for kids. So one day I was daydreaming of food, as you do (or as I do anyway) and I was thinking about the various refrigerated dough/biscuits/cinnamon roll standbys that are out there. More specifically, I was thinking about my husband’s penchant for Pillsbury™ Orange Rolls with Orange Icing (please note, this is not a sponsored post, I just really like this product!). Though I tend to be more of a traditional cinnamon roll kind of gal, I’m not one to turn down an orange roll. Throwing a can of those puppies in the oven became a quick and easy way to let this man know I love him, particularly in the early part of our relationship when we rarely woke before 10am on a non-work day (and I’m not even talking about the very beginning when we both worked at a restaurant and spent many nights living it up until dawn in NYC- waking before noon was unheard of in those days!). Back to my food-filled daydreams, it was at that moment that it occurred to me: why not use Orange Rolls to make an easy monkey bread?! I mean, what usually happens when great things combine forces? The answer is usually great things. This case was no exception. You still have the same ooey-gooey goodness, but with the most delicious and distinct orange flavor. Speaking of flavor, I think the addition of the orange zest and the fresh squeezed juice really elevates this and makes it taste extra special, as any good Christmas morning food should! If you want, you can totally this together the night before, although it’s so quick and easy to make, there’s really no need. This is versatile enough to serve as the primary component for a light breakfast or among many delicious dishes if you’re planning a more grand brunch with family. I used plastic bags to mix together the sugar mixture and coat the orange roll pieces. This helped eliminate extra mess and dishes. 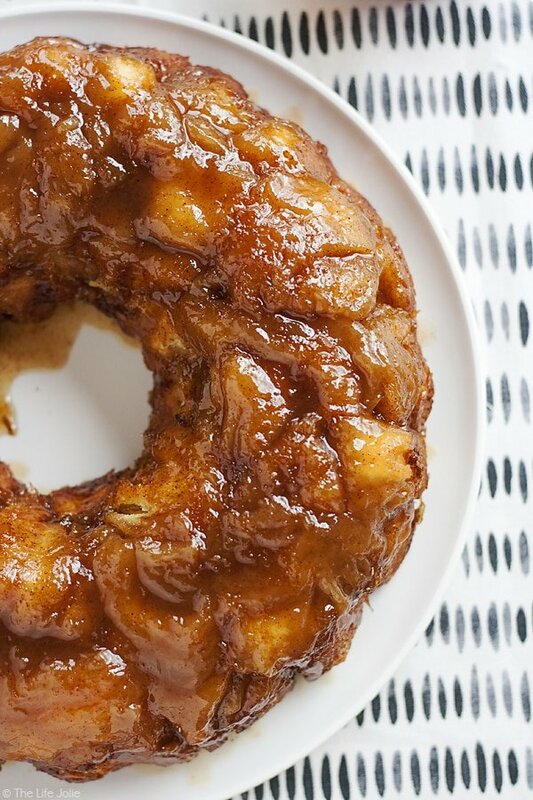 If you have an extreme sweet tooth you can totally drizzle the finished monkey bread with the glaze that comes with the roll. I found it to already be quite sweet so I didn’t do this. Be sure to spray the bundt pan with cooking spray to prevent sticking when you invert it. Preheat the oven to 350 degrees and spray the bundt pan with cooking spray. Set aside. In a plastic zipper bag combine granulated sugar, cinnamon and orange zest. Shake until well combined (I also used my fingers to break up and evenly distribute the orange zest). In a separate bowl whisk together butter, brown sugar and orange juice until fully combined. Set aside (keep the whisk with it because it might separate and you can whisk it again before adding it later). Cut each orange roll into quarters and lightly roll each quarter so that it doesn't fall apart. Place all the orange roll pieces into the zipper bag with the sugar mixture. Seal it well and shake until each piece of dough is fully coated in the sugar mixture. Place the entire contents of the bag into the prepared bundt pan. Pour the butter mixture evenly over the contents of the bundt pan. It will look too liqiud-y but it's not- the dough with absorb all that delicious buttery mixture. Bake for 30-40 minutes. Allow it to cool for around 10-15 minutes and then Turn it onto a plate and serve immediately. If not serving right away, cool completely and cover with plastic wrap until you're ready to serve. Freshly squeezed orange juice is best. This can be made or prepped the night before. If you want it to be extra sweet you can drizzle the orange icing over the top once you've plated the Monkey Bread- I find that it doesn't need it. Instead, I opted to stir a little bit of the icing into my coffee! December 5, 2016 at 12:15 pm Thank you- that sounds similar to my family's routine growing up! December 5, 2016 at 12:14 pm Bahahaha that's awesome!I mean, I would totally eat a ring of Orange Chicken as well but I think I'd opt for monkey bread! December 5, 2016 at 11:04 am I have never heard of monkey bread before, but anything with orange in it gets the thumbs up from me. December 5, 2016 at 12:13 pm Give it a try- it's dangerously addictive! December 5, 2016 at 11:13 am This looks like an incredible idea for breakfast...love that sticky gooey sweetness. December 5, 2016 at 11:44 am OMG you had me at that awesome glaze! 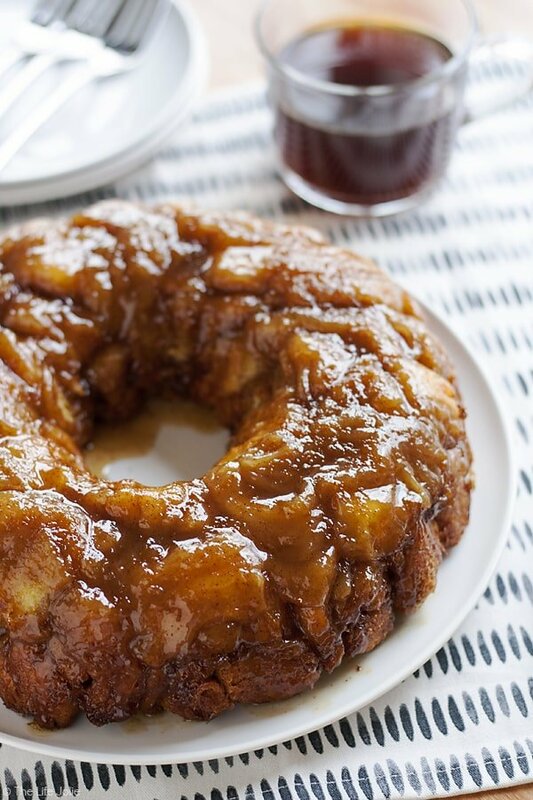 December 15, 2017 at 12:55 am Wonderful looking monkey bread!! December 15, 2017 at 5:23 pm Why thank you! 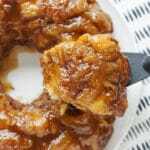 December 15, 2017 at 9:37 pm Monkey bread is so yummy! I can't wait to try this recipe! December 15, 2017 at 10:36 pm Enjoy! October 29, 2018 at 1:02 pm Question: I’m not an early bird and have to have a prepared ‘something breakfasty’ Every other Fri. By 9:00 am 😳 When you say can be made ahead, even with orange buttery glaze? Or add that to sugared pieces before baking? ?